Mr. WhiMSy love asked the hotel staff to purchase balloons for us & have them waiting in the room when we returned from a day of exploring. They delivered, & it really made Zoey feel so special! Thanks to the peeps at the Fairfield Inn By Marriott Denver Cherry Creek. Zoey even got a bag of m&m's when we first got there. And later the next day the girls were both gifted sodas & popcorn for our movie night! "See this!" & "Do you see that, mom?!" They had been saving their money for months to make purchases & wanted to choose JUST the right thing. 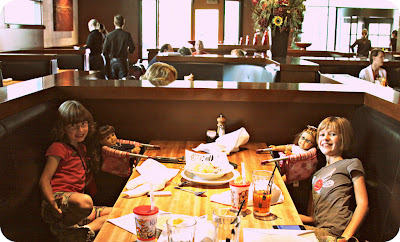 Daddy (overwhelmed in his own way) & I treated the girls to ear piercing & hair-do's for their dolls. Later in the evening we returned to the store for some free crafty fun. The girls got to make little Hawaiin lei's in celebration of Kanani, one of the newest dolls. It was so fun! 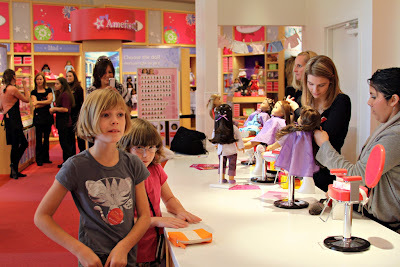 I could really do a whole post on the American Girl store. Seriously. 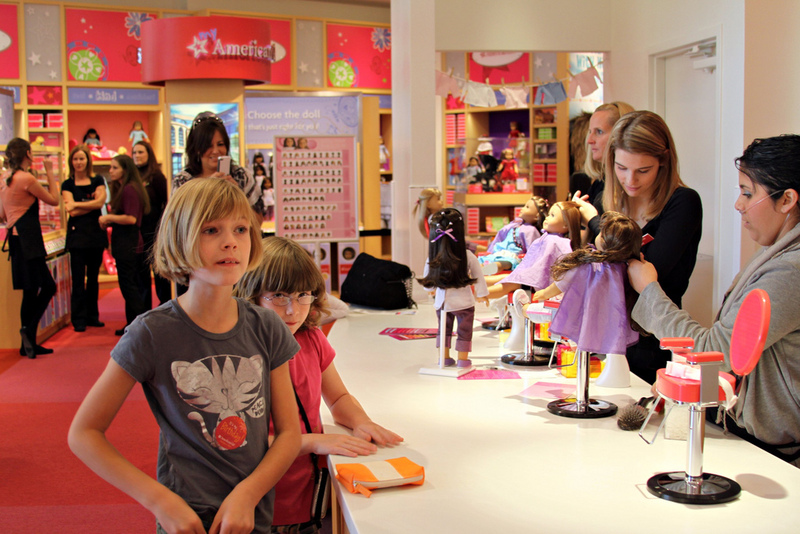 And the best part of our American Girl store visit? Zoey declared it "the best day of her life". This restaurant is right next door to the American Girl store in the Park Meadows Mall. They are "American Girl" doll friendly, which meant that they had seats for the dolls to sit in AND the girls got a free dessert for dining with their dolls. So, instead of a table for 4, we got a booth for 6. haha! 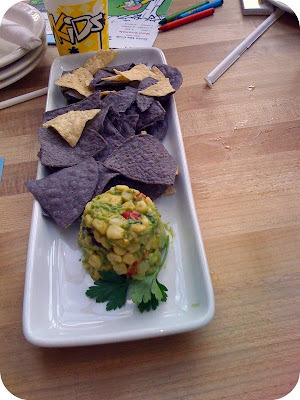 The food was DELICOUS! The chicken plate from the children's menu was my favorite. (I tasted everyone's food.) My side of honey roasted carrots was DIVINE! I must try to make some. One afternoon we walked up & down 16th Street in downtown Denver. There are free shuttle bus thingies that go up & down 16th Street, stopping at almost every block. We spotted "crepes" & immediately headed in that direction. The hubby & I have an affection for crepes. 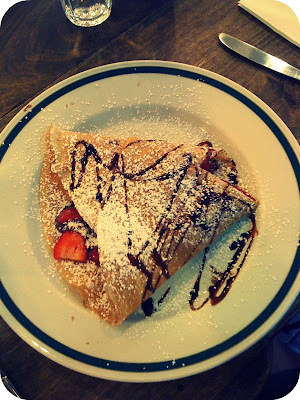 On our honeymoon in San Franciso, we got some crepes at a little crepe stand & they were amazing. One of my favorite memories for sure. Anyway, we sat inside this little French cafe & watched crepes being made right in front of us. The water was served in tall bottles---so cute! Zoey & I shared a strawberry, banana, & nutella crepe, drizzled with chocolate sauce & dusted with powdered sugar. Pazely had a chocolate crepe & dad had some crazy crepe with all kinds of stuff shoved inside. It was really yummy stop for sure. Along 16th Street (& maybe other parts of the city??) there were brightly painted pianos scattered about. The sign on the side of the piano read "We invite you to play this piano at your liesure. No cost. Anyone can do it. Anytime." Sadly, the girls & I didn't get to play. We were busy walking along 16th Street, visiting this shop & that place, etc. And then, when we decided it was time to tickle the ivories, it started raining & the pianos were being covered with protective tarps. Sadness. The girls begged & begged & begged to ride the bus. It goes up & down 16th Street. I personally like walking so I can see things & take photos! But, we accomodated their repetetive request. And they had a blast. 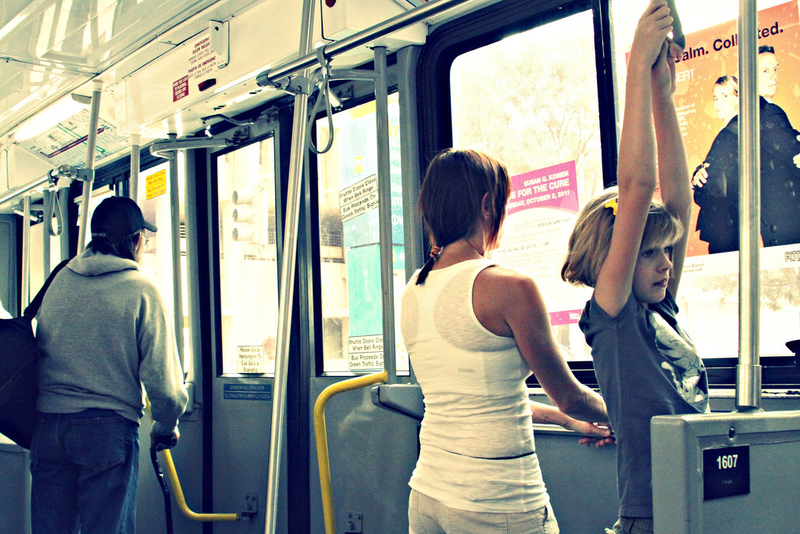 After each stop, which happened quite often, they would change seating or standing positions. I even had a drunk guy sit next to me, asking me to rate the severity of his black eye. Good times. A friend of mine told me I had to be sure & visit the "talking sidewalk". It's on Curtis Street, between 15th & 16th Streets in front of the Federal Reserve Bank Branch. 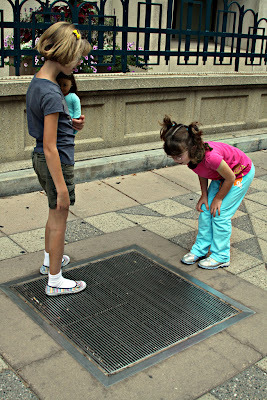 Sounds come up from the grates in the sidewalk. Waterfalls, cows mooing, pigs squealing, old wonky cars chug-chug-chugging along....It was really cool! I know this sounds silly. But we recently discovered how much money we can save if we rent movies through redbox rather than purchasing the EXPENSIVE movies on the TV at the hotel. We simply hook up one of the girls' portable DVD players to the hotel TV & we're good to go. Movie-watching is one of our favorite late-night things to do, after we've been out adventuring all day! 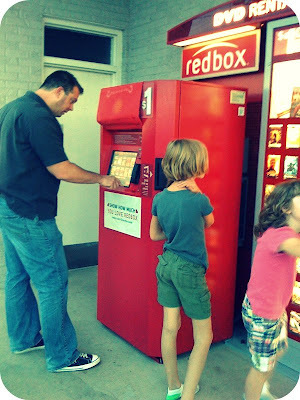 And, there's no redbox near our house, so it was a treat for us! We walked inside the Park Meadows Mall & found a Lego Store. The Lego wall along the back of the store just LOOKS so cool. It's a decorate fixture & a useful storage space for Legos---all in one. For 15 bucks, you can fill a bucket with all sorts of shapes & sizes & colors of Legos. There's also a station where you can build your own Lego person with all different choices of hair, heads, arms, accessories, legs, bodies, etc. And then along both sides of the store are displays of Lego scenes hidden behind porthole-like cases. 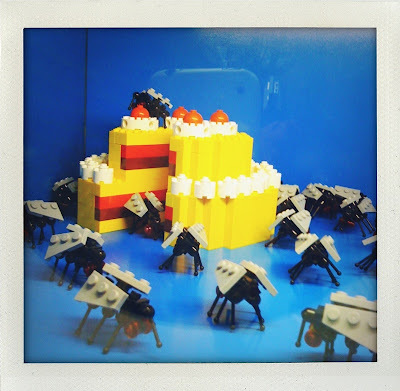 I loved the flies attacking the cake & the giant sandaled feet. The same friend that recommended the Soundwalk, also recommended we stop for a visit at this book store. I am so glad we did. What an amazing place. The Tattered Cover began in 1971 & has grown from a 950 sq. ft space to 3 expansive locations in the greater Denver metro area. 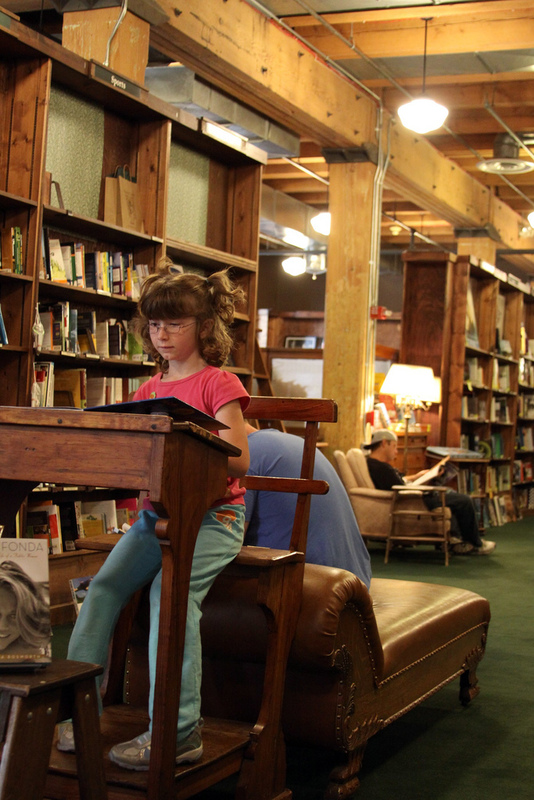 It's one of the largest independent bookstores in the United States. The girls LOVED looking around & finding secret little places to read in. The place is HUGE! The store has layers upon layers of books & cozy seating areas & beautiful old chairs & couches & chaises to lounge on. It's an amazing building & we spent a lot of time there. The children's area was one of my favorites. 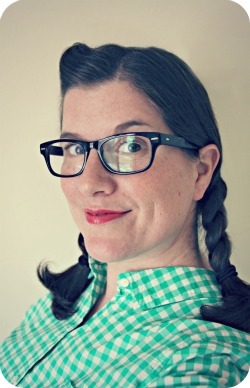 I browsed the kid's books while the Mr. sat upstairs, scanning the sports biographies. The upstairs does feel a bit like a library though. I felt I had to "hush" the girls several times so as not to bother the quiet readers in their silent nooks & peaceful crannies. As we ended our day of exploring one afternoon, walking along the streets, trying to remember WHICH parking lot we left the old trusty van in, we got wet & rained on. And it was fun! Ah, yes. Our "create some fabulous memories" tank is now full. Click HERE to view all the pics from our trip. 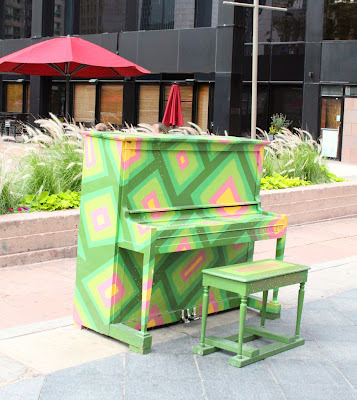 I love the painted pianos. Neatest thing ever! 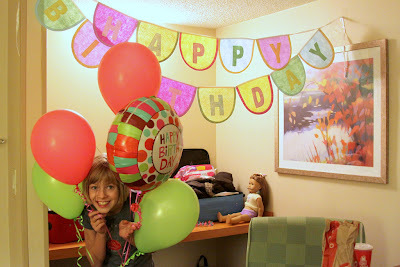 Did you make Zoey's birthday sign, and if so how? No, I didn't make it. I picked it up a couple years ago for SUPER cheap at Target---less than 2 bucks! I love it! I LOVE this idea. Memories and a family trip are Much better than an expensive toy that will be forgotten in a matter of months.